Q: Define background color of the flipping booklet? With PDF to FlashBook, you can not only choose a picture as background of the flipping pages, but also, customize the background color if you don’t want any images stay at the back of your book. 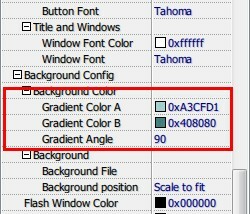 Find “background->background color” above the “background file” option. You can see “gradient color A” and “gradient color B”, the A stands for the above part color of the background and B stands for the below part. “gradient angle” means the interface of the two parts’ inclination. If you set the two parts in different colors and with different angle, you’ll get totally different effects. Just try all the combinations and create a perfect match!